PITTSBURGH–(BUSINESS WIRE)–EQM Midstream Partners, LP (NYSE: EQM) today announced third quarter 2018 results, including net income of $209.9 million, adjusted EBITDA of $280.1 million, net cash provided by operating activities of $242.6 million, and distributable cash flow of $218.6 million. EQM operating income was $233.5 million, which was 60% higher than last year. The Non-GAAP Disclosures section of this news release provides reconciliations of non-GAAP financial measures to their most comparable GAAP financial measure as well as important disclosures regarding projected adjusted EBITDA and projected distributable cash flow. EQGP Holdings, LP (NYSE: EQGP) today announced net income attributable to EQGP of $97.5 million for the third quarter 2018. On July 23, 2018 EQM closed the acquisition of Rice Midstream Partners LP (RMP), with each RMP unitholder receiving 0.3319 units of EQM. On May 1, 2018 EQM acquired the Olympus gathering system and a 75% interest in the Strike Force gathering system (May 2018 Acquisition) from EQT Corporation (EQT). EQM also purchased the remaining 25% interest in the Strike Force gathering system from Gulfport Energy on May 1, 2018. As a result of the RMP acquisition and the May 2018 Acquisition, EQM’s financial statements have been retrospectively recast to include the pre-acquisition results of each acquisition from the time common control began on November 13, 2017, which is when EQT closed its acquisition of Rice Energy. EQM’s third quarter operating revenue increased $158.3 million, a 77% increase compared to the same quarter last year. The RMP acquisition and the May 2018 Acquisition accounted for $147.8 million of the increase, with the remaining increase from higher contracted firm transmission and gathering capacity. Operating expenses increased $70.5 million versus the third quarter of 2017, with approximately $67.0 million resulting from the RMP acquisition and the May 2018 Acquisition. The remaining increase was primarily related to $2.2 million in transaction costs related to the RMP acquisition, and higher system throughput and additional assets placed in service, consistent with the growth in the business. For the third quarter of 2018, EQM will pay a quarterly cash distribution of $1.115 per unit, which will be paid on November 14, 2018 to EQM unitholders of record at the close of business on November 2, 2018. The quarterly cash distribution is 2% higher than the second quarter of 2018 and is 14% higher than the third quarter of 2017. For the third quarter of 2018, EQGP will pay a quarterly cash distribution of $0.315 per unit, which will be paid on November 23, 2018 to EQGP unitholders of record at the close of business on November 2, 2018. The quarterly cash distribution is 3% higher than the second quarter of 2018 and is 38% higher than the third quarter 2017 distribution. For the quarter, EQGP expects to receive $97.7 million of cash distributions from EQM and distribute $95.3 million. Expansion capital expenditures and capital contributions to Mountain Valley Pipeline, LLC (MVP JV), totaled $489 million for the third quarter 2018 and $1.0 billion year-to-date. million of expansion capital expenditures had been spent on the RMP assets prior to the RMP acquisition. Ongoing maintenance capital expenditures are cash expenditures made to maintain, over the long-term, EQM operating capacity or operating income. EQM ongoing maintenance capital expenditures, net of expected reimbursements, totaled $14 million in the third quarter 2018 and $25 million year-to-date. EQM forecasts full-year 2018 ongoing maintenance capital expenditures of $45 million. On October 2, 2018, the U.S. Court of Appeals for the Fourth Circuit issued a decision to vacate the Clean Water Act Section 404 stream and wetland crossing permit (Nationwide 12 permit) issued by the Huntington District of the U.S. Army Corps of Engineers (USACE). Subsequently, the Norfolk District and the Pittsburgh District of the USACE suspended its Nationwide 12 permit pending resolution of the Nationwide 12 permit by the Huntington District. The court decision and suspension impacts stream and wetland crossings in West Virginia and Virginia. During the past few months, the West Virginia Department of Environmental Protection (WVDEP) has proposed modifications to its Section 401 Nationwide Permit Certification which clarify that a 72-hour limitation does not apply to dry-cut crossing methods and other environmentally protective crossing methods. MVP JV intends to apply for a new or reissued permit with the USACE as soon as practical following the WVDEP modification process. MVP JV expects to secure the Nationwide 12 permit from the USACE in Q1 2019. MVP JV continues construction activities at the three compressor sites and along much of the upland portions of the route. MVP JV anticipates a fourth quarter 2019 in-service date and estimates a total project cost of $4.6 billion, with EQM funding $2.2 billion. MVP JV has secured a total of 2 Bcf per day of firm capacity commitments at 20-year terms. The MVP Southgate project will receive gas from MVP and extend approximately 70 miles south to new delivery points in Rockingham and Alamance Counties, North Carolina. The project is anchored by a 300 MMcf per day firm capacity commitment from PSNC Energy. The preliminary project cost estimate is $350 to $500 million, depending on final project scope. The capital is expected to be spent in 2019 and 2020. EQM has a 33% ownership interest and will operate the pipeline. Subject to approval by the FERC, MVP Southgate has a targeted in-service date of the fourth quarter 2020. The Hammerhead pipeline is designed as a 1.2 Bcf per day gathering header pipeline that will traverse approximately 64 miles from southwestern Pennsylvania to Mobley, West Virginia, where both the MVP and the Ohio Valley Connector originate. The pipeline is estimated to cost $555 million and is expected to be placed in-service during the fourth quarter of 2019 in-conjunction with MVP. In February 2018 EQT announced a plan to separate its upstream and midstream businesses. Following the separation, Equitrans Midstream Corporation (NYSE: ETRN) will own the midstream interest held by EQT, which consists of the general partner interest in EQGP, 276.0 million units of EQGP and 15.4 million units of EQM. Each share of EQT common stock held as of the close of business on November 1, 2018 (Record Date) will receive 0.8 share of ETRN common stock. The distribution date is November 12, 2018. In connection with the separation, ETRN will hold an investor presentation on Monday, October 29, 2018. The presentation will be webcast live beginning at approximately 10:00 AM until 11:30 AM, Eastern Time via EQT’s web site at www.eqt.com and via ETRN’s web site at www.equitransmidstream.com, with a replay available for seven days following the call. EQM believes that adjusted EBITDA, run rate adjusted EBITDA and distributable cash flow provide useful information to investors in assessing EQM’s results of operations and financial condition. Adjusted EBITDA, run rate adjusted EBITDA and distributable cash flow should not be considered as alternatives to net income, operating income, net cash provided by operating activities or any other measure of financial performance or liquidity presented in accordance with GAAP. Adjusted EBITDA, run rate adjusted EBITDA and distributable cash flow have important limitations as analytical tools because they exclude some, but not all, items that affect net income and net cash provided by operating activities. Additionally, because adjusted EBITDA and distributable cash flow may be defined differently by other companies in its industry, EQM’s definitions of adjusted EBITDA, run rate adjusted EBITDA and distributable cash flow may not be comparable to similarly titled measures of other companies, thereby diminishing the utility of the measures. The table below reconciles adjusted EBITDA and distributable cash flow with net income and net cash provided by operating activities as derived from the statements of consolidated operations and cash flows to be included in EQM’s quarterly report on Form 10-Q for the quarter ended September 30, 2018. Projected firm project EBITDA means the projected earnings before interest, taxes and depreciation of EQM’s firm capacity gathering and transmission projects, including the Hammerhead, Equitrans Expansion and other gathering projects, plus EQM’s proportionate interest of the projected earnings before interest, taxes and depreciation of Mountain Valley Pipeline, LLC’s MVP and MVP Southgate projects. Projected water EBITDA means the projected earnings before interest, taxes and depreciation of EQM’s water services business. Projected firm project EBITDA and projected water EBITDA are non-GAAP supplemental financial measures that management and external users of EQM’s consolidated financial statements, such as industry analysts, investors, lenders and rating agencies, use to assess the anticipated impact of EQM’s firm capacity projects, both on an aggregate and project-by-project basis, and EQM’s water services business on EQM’s operating performance, the project returns on firm capacity projects and EQM’s ability to incur and service debt and fund capital expenditures. Firm project EBITDA and water EBITDA should not be considered as alternatives to net income, operating income or any other measure of financial performance presented in accordance with GAAP. Firm project EBITDA and water EBITDA have important limitations as analytical tools because they exclude some, but not all, items that affect net income. Additionally, because firm project EBITDA and water EBITDA may be defined differently by other companies in EQM’s industry, the definitions of firm project EBITDA and water EBITDA may not be comparable to similarly titled measures of other companies, thereby diminishing the utility of the measures. EQM has not provided projected net income from the firm projects or the projected net income of EQM’s water business segment, the most comparable financial measures calculated in accordance with GAAP, or reconciliation of projected firm project EBITDA or projected water EBITDA to projected net income of the firm projects or projected net income of EQM’s water business segment. The projects are under construction projects that, upon completion, will be reported in EQM’s Gathering and Transmission business segments. EQM does not allocate certain costs, such as interest expenses, to individual assets within its business segments. In addition, for the MVP and MVP Southgate projects, EQM does not provide guidance with respect to the intra-year timing of its or Mountain Valley Pipeline, LLC’s capital spending, which impact AFUDC-debt and equity and equity earnings, among other things, that are reconciling items between adjusted firm project EBITDA and net income of the projects. The timing of capital expenditures is volatile as it depends on weather, regulatory approvals, contractor availability, system performance and various other items. Therefore, the projected net income of the firm projects, in the aggregate or on a project-by-project basis, and the projected net income of EQM’s water business segment, and reconciliations of projected firm project EBITDA and projected water EBITDA to projected net income of the firm projects and projected net income of EQM’s water business segment are not available without unreasonable effort. EQM is unable to project net cash provided by operating activities or provide the related reconciliation of projected net cash provided by operating activities to projected distributable cash flow, the most comparable financial measure calculated in accordance with GAAP, because net cash provided by operating activities includes the impact of changes in operating assets and liabilities. Changes in operating assets and liabilities relate to the timing of EQM’s cash receipts and disbursements that may not relate to the period in which the operating activities occurred, and EQM is unable to project these timing differences with any reasonable degree of accuracy to a specific day, three or more months in advance. EQM is also unable to provide a reconciliation of its projected adjusted EBITDA or run rate adjusted EBITDA to projected net income, the most comparable financial measure calculated in accordance with GAAP, because EQM does not provide guidance with respect to the intra-year timing of its or Mountain Valley Pipeline, LLC’s capital spending, which impact AFUDC-debt and equity and equity earnings, among other items, that are reconciling items between adjusted EBITDA and net income. The timing of capital expenditures is volatile as it depends on weather, regulatory approvals, contractor availability, system performance and various other items. EQM provides a range for the forecasts of net income, adjusted EBITDA and distributable cash flow to allow for the variability in the timing of cash receipts and disbursements, capital spending and the impact on the related reconciling items, many of which interplay with each other. Therefore, the reconciliations of projected distributable cash flow, run rate adjusted EBITDA and adjusted EBITDA to projected net cash provided by operating activities and net income, as applicable, are not available without unreasonable effort. Reflects cash distribution of $1.115 per limited partner unit for the third quarter 2018 and 120,456,425 limited partner units outstanding as of July 25, 2018. If limited partner units are issued on or prior to November 2, 2018, the aggregate level of all distributions will be higher. EQM and EQGP will host a joint live webcast with security analysts today at 11:30 a.m. ET. Topics include third quarter 2018 financial results, operating results, the separation of EQT’s production and midstream businesses and other matters. The webcast is available at www.eqm-midstreampartners.com, with a replay available for seven days following the call. EQT, which owns EQGP’s general partner and holds a 91% limited partner interest in EQGP, will also host a webcast with security analysts today at 10:30 a.m. ET. EQM and EQGP unitholders are encouraged to listen to EQT’s webcast, as the discussion may include topics relevant to EQM and EQGP, such as EQT’s financial and operational results, specific reference to EQM and EQGP third quarter 2018 results and the separation of EQT’s production and midstream businesses. The webcast can be accessed via www.eqt.com, with a replay available for seven days following the call. 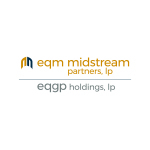 EQM Midstream Partners, LP (EQM) is a growth-oriented limited partnership formed by EQT Corporation to own, operate, acquire, and develop midstream assets in the Appalachian Basin. As the third largest gatherer of natural gas in the United States, EQM provides midstream services to EQT Corporation and other producers through its strategically located natural gas transmission, storage, and gathering systems, and water services to support energy development and production in the Marcellus and Utica regions. EQM owns approximately 950 miles of FERC-regulated interstate pipelines and approximately 2,130 miles of high-and low-pressure gathering lines. EQM and EQGP management speak to investors from time to time and the analyst presentation for these discussions, which is updated periodically, is available via the EQM and EQGP website at www.eqm-midstreampartners.com. The distribution amounts from EQM to EQGP are subject to change if EQM issues additional common units on or prior to the record date for the third quarter 2018 distribution. Disclosures in this news release contain certain forward-looking statements within the meaning of Section 21E of the Securities Exchange Act of 1934, as amended, and Section 27A of the Securities Act of 1933, as amended. Statements that do not relate strictly to historical or current facts are forward-looking. Without limiting the generality of the foregoing, forward-looking statements contained in this news release specifically include the expectations of plans, strategies, objectives and growth and anticipated financial and operational performance of EQGP and its subsidiaries, including EQM, including guidance regarding EQM’s gathering, transmission and storage and water revenue and volume growth; revenue and expense projections; infrastructure programs (including the timing, cost, capacity and sources of funding with respect to gathering, transmission and water projects); the cost, capacity, timing of regulatory approvals and anticipated in-service date of the Mountain Valley Pipeline (MVP) mainline and MVP Southgate projects; the ultimate terms, partners and structure of, and EQM’s ownership interests in, the MVP joint ventures; the timing of the proposed separation of EQT’s production and midstream businesses, the parties’ ability to complete the separation and the effects of the change of control of EQM and EQGP on the partnerships; the expected synergies resulting from the streamlining transactions and the expected disynergies associated with the separation of EQT’s production and midstream businesses; asset acquisitions, including EQM’s ability to complete any asset purchases and anticipated synergies and accretion associated with any acquisition; the expected benefits to EQM resulting from EQT’s acquisition of Rice Energy Inc.